Coffee was introduced throughout the islands of Indonesia by the Dutch in the 1600s, and was first exported by the Dutch East India Company in the early 1700s: Java was the first of the islands to cultivate coffee, and that long history with the plant on the land is part of the reason that coffee is generically known as "java." Large Dutch-owned plantations were the norm, and the laborers and locals suffered financially and politically under the colonial regime: The 1860 novel Max Havelaar: Or the Coffee Auctions of the Dutch Trading Company outlined many of the ways that the Dutch government and landowners abused and oppressed the Indonesian people, specifically on Sumatra and Java. Poverty, starvation, and destitution were common among coffee workers and within the indigenous communities. In the 1860s and 1870s, a coffee-leaf-rust epidemic decimated the coffee market in Indonesia, and led to the abandonment of many estates by the Dutch; as the plantations broke up, laborers took up small plots of the land, eventually replanting most of the old-stock Arabica with Robusta coffee and various more disease-resistant hybrids. This land redistribution created the predominance of smallholder growers on the islands, which exists to this day. Taken as a whole, Indonesia is the fourth-largest coffee-producing country in the world, though Java—once a powerhouse producer and the primary origin for the world's most sought-after supply—has not come near to reclaiming its position at the top of the list worldwide. Javanese coffees have long been distinct for their earthy, savory, somewhat vegetal or herbaceous characteristics, in part contributed by the climate and the mix of varieties grown, but also due to a specific post-harvest processing style called Wet-Hulling, or locally known as Giling Basah, which imparts much of the unique qualities these coffees have. One of the most famous and misunderstood terms in coffee is "Mocha Java," which historically refers to a blend made from coffee beans from Java and from Yemen. (Yemeni coffee has long been called "Mocha" after the main port, which is alternately spelled Mokha, Mokka, and Mocha, among other variations.) The deep chocolate and winey berry of the Yemen coffee was thought to be a perfect complement to the Javanese profile, with its savory complexity. However, throughout the centuries the words "mocha" and "java" came to be used colloquially for other coffee-related terms, causing much confusion among present-day consumers. Today, "mocha" is used to describe a beverage made with espresso and chocolate, harking back to the chocolaty characteristics Yemen's coffee is famous for; while "java" rather generically acts as a stand-in for "coffee" in slang and popular usage. Indonesia is a fascinating and diverse origin, and a complex one in which to work: While the majority of the coffee on the island is grown by smallholders, there are still four or five major estates that account not only for a large area of coffee production (around 4,000 hectares), but also much of the collection and processing. Smallholder farmers will often sell their cherry to the estates, which will grade and blend them for sale under the estate's name. In the past, Cafe Imports has sourced directly from one of those estates, and continues to seek direct relationships at origin, with several ongoing projects and relationships in development. 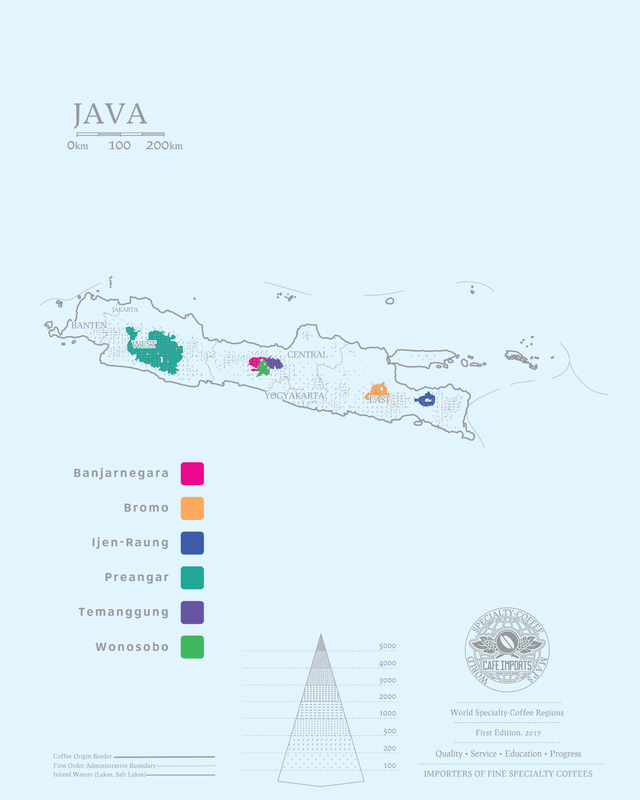 However, we do not currently offer any origin-direct coffees from Java, and instead source lots for their cup quality and characteristics, offering little traceability.